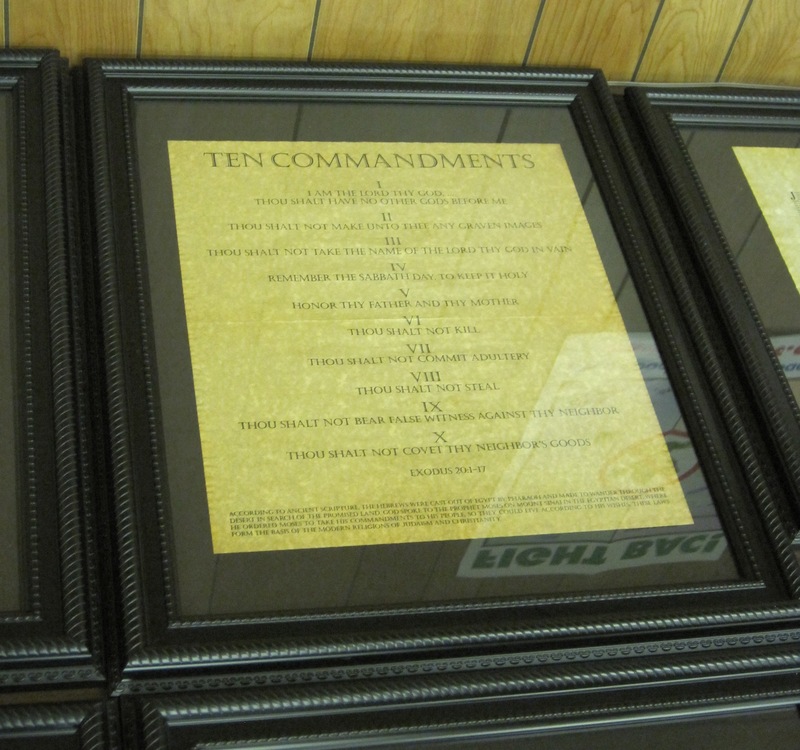 In 1999, a local pastor donated several framed displays, of a portion of the Constitution of the United States and an abridged Protestant Ten Commandments, to Giles County Public Schools. Despite a student’s 2004 appeal to local and state officials, the display remained in school buildings until 2010, when the American Civil Liberties Union and the Freedom From Religion Foundation requested that the display be removed. In the subsequent months Giles County has become the center of another chapter in the ongoing, fragmented nationwide debate over secular government. This page is a timeline of events in the Giles County Ten Commandments saga and a repository for sources for information and public reactions. I will generally stick to regional news sources (and i’m preferential to The Roanoke Times) but when the national networks pick up on the story, and especially when they offer information or perspectives inaccessible through regional channels, i will include their articles and opinions as well. Articles and press releases are cited below summaries while correspondence is hyperlinked within summaries. Please send me any sources i’ve omitted or additions or corrections to anything that’s incomplete or inaccurate! Note: The Roanoke Times recently redesigned their website and content from the old site is still being transferred to the new. The links below may not work for some time; if you find that working links are available but not used below, please let me know! April 1999: Following the Columbine High School massacre, Pastor Shahn Wilburn of Riverview Baptist Church consulted Giles County Superintendent Robert McCracken about placing a display in the public schools intended “to remind students of right from wrong, the United States’ Christian heritage, the law and, particularly, the sixth commandment: ‘Thou shalt not kill. '” McCracken consented and the display went up. 8 December 2010: The Freedom From Religion Foundation, in a letter to Superintendent Terry Arbogast on behalf of a local complainant, referred to the Constitution–Decalogue display in Macy McClaugherty School and requested that the display be removed. The letter cited the 1980 Supreme Court ruling in Stone v. Graham. 17 December 2010: Dr. Arbogast replied to the FFRF, affirming that the display would be removed and replaced with another historical document over the Christmas break. Copies of the Declaration of Independence replaced the displays. 20 January 2011: At least 100, possibly 200, residents attended the first Giles County School Board meeting of the year. Eight — including Rev. Wilburn, Pastor Creger, Pastor Dan Kelly of New Valley Fellowship in Narrows, and Barbara Scheid of Giles High School, who read a letter from several students — spoke in opposition to the taking down of the Ten Commandments. A motion was made to return the display to the schools and the board voted unanimously. The Board of Supervisors — including Chair Eric Gentry, who had spoken in opposition to the removal — later supported the decision. 21 January 2011: The American Civil Liberties Union objected to the decision to repost the Constitution–Decalogue display and considered joining the FFRF in taking legal action. 21 January 2011: Rev. Kelly proposed a project with other local preachers to incorporate several historical documents into a new display. The display would be built by local craftspersons and privately funded and posted. 12 February 2011: Annie Laurie Gaylor, co-president of the FFRF, mentioned on Freethought Radio that plaintiffs in Giles County were willing to take the issue to court. 15 February 2011: At the next School Board meeting, attorney Bobby Lilly discussed a possible several-document display, being discussed by the Giles County Bar Association, that would incorporate the original Constitution and Decalogue plus several others, for example the Mayflower Compact. 16 February 2011: FFRF attorney Patrick Elliott affirms that the foundation is planning to bring suit to U.S. District Court in Roanoke, and that the plaintiffs may remain anonymous. 22 February 2011: At a special convened School Board meeting, member Drema McMahon, in light of Liberty Counsel‘s refusal to represent the School Board if the FFRF and ACLU bring suit, made a motion that the display be removed. Member Lewis Webb seconded and the vote was unanimous. In Smyth County, a group of ministers approached their school board about posting copies of the Ten Commandments in their schools. Students of Giles and nearby schools posted copies of the Decalogue on their lockers. Members of the Fellowship of Christian Athletes at Floyd County High School had copies removed from their lockers but returned after the ACLU complained to school officials. Residents and businesses of Giles County campaigned for the display to be returned. 23 February 2011: The FFRF honored Sarah McNair (née Myers) with its Thomas Jefferson Youth Activist Award. 7 March 2011: 50 to 100 students of Giles High School, including at least one parent, staged a protest against the removal of the display. Some 15 remained until the end of the school day. 10 March 2011: Reverend Betty Carter of United Christian Church led 15 Giles County residents in a protest at Giles High School against the removal of the display. No students participated in the protest. 15 March 2011: At the next school board meeting, Mr. Lilly described the historical documents display that he and several others had been assembling. They designed the display to tie together nine documents in an historical context. The centerpiece was to be the Declaration of Independence, framed above (preceding) by the Mayflower Compact and the Virginia Declaration of Rights and below (following) by the Virginia Statute for Religious Freedom and the Bill of Rights. The Magna Carta and the Ten Commandments were to lie to the left of this centerpiece, interpreted as documents inspirational to the principles embodied by the centerpiece, and the Star-Spangled Banner and an image of Lady Justice were to lie to the right, as contemporary manifestations of them. 12 April 2011: School Board Member-at-Large J. B. Buckland acknowledged receipt of Mr. Lilly’s proposal, which he had forwarded to school board attorneys. 19 May 2011: At the next School Board meeting, Mr. Lilly proposed a resolution that the School Board might adopt to allow for the posting of the revised historical documents display. The resolution stipulated that the display would be privately funded and included a provision allowing any individual or organization to request that another document of historical significance be added to the display. Rev. Wilburn spoke in support of the display and asserted the Christian heritage of the United States. A vote on the resolution and the allowing of the display was scheduled for the next meeting. 7 June 2011: At the next School Board meeting, a member of the Freethinkers at Virginia Tech urged the board not to support the resolution and resident Charlie Henderson urged the board to support it. Ronald Whitehead made a motion to adopt the resolution, which Joseph Gollehon seconded. The board adopted the resolution in a 3–2 vote: Buckland, Gollehon, and Whitehead for, Webb and McMahon against. After the vote, Mrs. McMahon and Dr. Webb explained their reasons. Attendees reassured the board that they would raise the money to support a defense in court. Dr. Arbogast had consulted Liberty Counsel, who agreed to represent the school board for free if a suit were brought. 23 June 2011: Mr. Lilly announced that he would run for commonwealth’s attorney. 13 September 2011: A student and parent of Narrows High School sued the Giles County School Board over the posting of the Ten Commandments. The legal complaint asked that a judge order the display removed and the plaintiffs nominally compensated. The plaintiffs requested anonymity in the proceedings due to public hostility in Giles County over the display and threats made against the FFRF and ACLU. The student is known as Doe 1 and their parent as Doe 2. 11 October 2011: The School Board objected to the plaintiffs’ request for anonymity and requested instead that Doe 2’s name and Doe 1’s initials be made public, on the grounds that threats are exaggerated and that the board should be able to learn whether they indeed pass by the display regularly. The FFRF responded, maintaining that a hostile atmosphere exists in Giles and that even a student’s initials would identify them. 19 October 2011: Liberty Counsel, representing the School Board, submitted a motion to dismiss the case. They argue that the display is allocated on public space for privately funded framed documents, and therefore not a government endorsement of religion. 2 November 2011: The ACLU responded to the motion to dismiss with a brief asserting that by voting to allow the display to be posted, and by having the authority to take it down, the School Board in its governmental capacity is responsible for the message conveyed by the display. 28 November 2011: At a hearing on the merit of the ACLU–FFRF lawsuit and the anonymity of the plaintiffs, U.S. District Judge Michael Urbanski denied the motion to dismiss the case and ruled that Doe 1 and Doe 2 may remain anonymous. Urbanski gave lawyers Staver (Liberty Counsel) and Glenberg (ACLU of Virginia) 14 days to work out arrangements regarding the protective order. The trial was scheduled for May, before a senior student (as Doe 1 may be) would lose standing. Lawyers drafted a compromise protective order that allowed Dr. Arbogast and network administrator Jeff Young to know the student’s identity, which Judge Urbanski signed on 12 December. 11 April 2012: Counsel for both parties submitted motions for summary judgment to Judge Urbanski, meaning that, absent disputed facts, Urbanski would make a decision based on legal precedent. The School Board, represented by Liberty Counsel, asked that the lawsuit be dismissed on the grounds that the display was privately funded and not religiously motivated: The display now includes 19 documents, including new additions the Northwest Ordinance and the First Charter of Virginia. Doe 1 and Doe 2, represented by the ACLU, asked that the display be declared unconstitutional and ordered taken down. Their brief included depositions by school board members as evidence that the display was religiously motivated. Mr. Urbanski scheduled a hearing for oral arguments for 7 May. 7 May 2012: Judge Urbanski heard oral arguments from ACLU and Liberty attorneys but granted neither motion for summary judgment. He instead instructed attorneys from both sides into mediation with Magistrate Judge Robert Ballou. Urbanski noted the School Board’s religious motivations for reposting the original display but did not discuss their motivations for posting the revised display. He suggested a compromise commandments display containing only the latter six more secular commandments, evidently a new prospect in Ten Commandments case history. If mediation fails then Urbanski will decide the case based on precedent. 30 May 2012: In a special meeting, the Giles County School Board voted unanimously to include a facsimile of a textbook page on “Roots of Democracy” with the Narrows High School Historical Documents Display and to withhold approval for the Ten Commandments in such displays pending clarification from the courts, including taking down the one at Narrows. 28 June 2012: At a closed meeting, the school board approved their proposed settlement agreement with the plaintiffs, reached during mediation in early June, to leave the “Roots of Democracy” textbook page in the Historical Documents Display and not allow the Ten Commandments to join them. Both the school board and the ACLU will bear their own attorneys’ fees, but the school board may have to pay the ACLU’s legal costs, over $6000. Urbanski will review the agreement, and if he approves it then the case will be resolved. 3 July 2012: Judge Urbanski approved the settlement agreement and may be asked to enforce it as part of an eight-year jurisdiction over the matter. A third party may relieve the school board of the ACLU’s legal costs. This timeline was originally put together on Cory’s personal blog.